For example, I have this category that I want to redirect it to product page, is this possible? Then I want this Corporate Gifts Url key redirects to kati-birch-forest product INSTEAD of the category's own url key. How do we do this? Is this possible? Thanks. 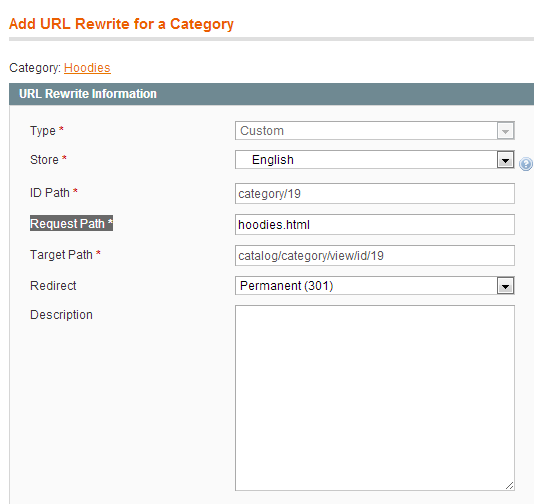 You can do this by "URL Rewrite Management"
Catalog->URL Rewrite Management-> Click "Add URL Rewrite" button Then Select "For Category" -> Select a category you want to rewrite to product page. Then enter your product url in 4th field "Request Path". here hoodies.html is my product URL: http://localhost.com/magento/hoodies.html and then Select "redirect permanent 301" from the list "Redirect". To achieve this, you need to do url forwarding either by .htaccess file or from CDN if using any. This can't be done by Magento only. Easy way to do is creating the url redirection entries in .htaccess file. Not the answer you're looking for? Browse other questions tagged magento-1.9 product category url or ask your own question. How to redirect product link to a store view? How to get product category URL Key? How to access subcategory without having url-key of the parent category in the url?